Don’t believe what people tell you. 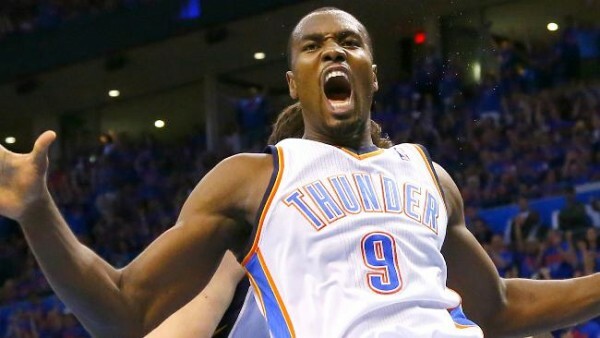 Serge Ibaka out for the playoffs? 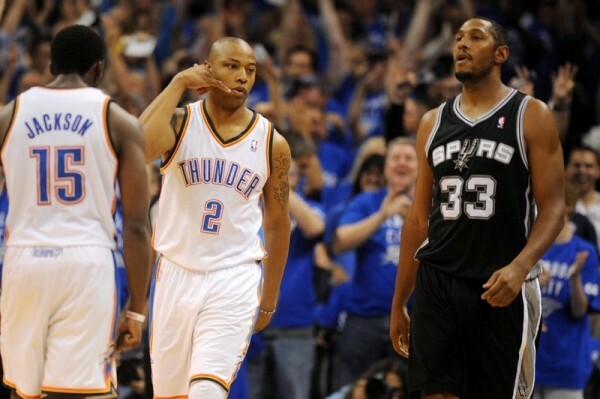 He looked fine and more than that, providing offensive and defensive help to the Oklahoma City Thunder with their backs to the wall, winning their first game in the 2014 Western conference finals thanks to an overall improvement and a lot of officiating help, beating the San Antonio Spurs 106-97 who still hold a 2-1 lead in the series, but have a lot of adjusting to do. Ibaka had his moments of limping, but that didn’t stop Scott Brooks from playing him for 30 minutes in which he contributed 15 points (6-of-7 from the field) with 7 rebounds and 4 blocks and more than anything making it a completely different game in terms of how the Spurs get their points, as the combinations of him next to Steven Adams especially made it very difficult for the Spurs to get anything going inside. It was a wild, turnover filled start to the game. The Thunder didn’t exactly shut down the Spurs on defense, as Tim Duncan had a very strong start before cooling off in the second half to finish with 16 points on 7-0f-17 from the field and Manu Ginobili seemed almost perfect from beyond the arc, hitting 6-of-9 to lead the Spurs in scoring with 23 points. Russell Westbrook was great early on and was a lot more active and important to the Thunder with 26 points, 8 rebounds and 7 assists, while Kevin Durant added 25 points and 10 rebounds but like Westbrook mostly relied on free throws to keep it going, once again struggling with Leonard and Green. Ibaka added the fear factor in the paint which made Tony Parker seem a bit stunned and at some point, after slipping to the floor as he was trying to run around three players on his way to the paint, very much frustrated. Parker scored only 9 points on 4-of-13 from the field, looking very hesitant with his decision making and often taking bad shots in an attempt to get away from the very crowded paint. Kawhi Leonard sometimes seems to be too caught up in proving how good he is, which turns out all wrong, resulting in a bad offensive night for him, scoring only 10 points on 4-of-11 from the field. It’s impossible to review this game without taking a look at what the officials did. Conspiracy theory? Probably not. But when the Thunder take 22 free throws in one quarter while the Spurs don’t get a single one, it’s not just weird numbers. The Thunder got to the line on pretty much the slightest of touches and even less than that. The Spurs didn’t push into the paint a lot, but deserved a few easy points which they would not get unless someone would be hacked. More than anything, the offensive foul called on Patty Mills while Reggie Jackson was fouling him, cancelling out a very important 3-pointer by the Australian point guard, killed the game and launched the Thunder on one last momentum run to secure the win. From here it’s time for reactions and adjustments. Getting Ibaka back may have resulted in him playing more than he should, but Brooks was tired of small ball lineups he hates using. Nick Collison and Thabo Sefolosha were thrown out of the rotation, punished for their previous bad game. The Spurs had success with certain lineups, but a lot of Popovich’s work for the next game is getting his players out of habits they quickly got accustomed to in the first couple of games. It’s a very different story now, as the Thunder once again look like that complete team with enough offensive weapons to use around Durant and Westbrook, helping them out and making it very difficult to completely contain. Their defense is back to its usual form: Clogging the paint and being quick enough to rush out and disturb shooters. The Spurs need to change their gameplan, because the current one, even without the officials intervening, works in the Thunder’s favor.